No doubt was founded in 1986 by siblings Eric and Gwen Stefani. They recruited other members and started playing live. After some years and several line-up changes they finally signed a record deal, which led to their debut album 'No doubt', released in 1992. Three years later, they released 'Tragic kingdom', which spawned their first worldwide hit, 'Don't speak'. 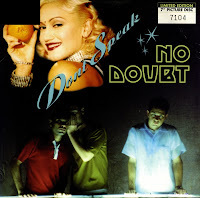 'Don't speak' reached number 1 in several countries around the world, including the UK and the Netherlands. This limited edition picture disc (which you can hear is not of the best quality sound-wise) was released in the UK only.